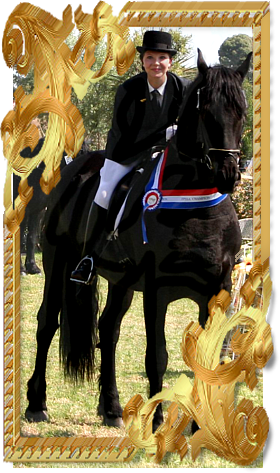 Benmar-Black Friesian Stud was established in 2003 and is situated at Wolvekrans in the Magaliesburg District of South Africa, 2013 is our 10th anniversary as registered breeders with The Friesian Society. It all started with the purchase of our first Friesian Black Magic. Our Stallion, Wiebe van Doorndraai (Brandus 345), was bought in 2005 and in August 2006 we produced the first of seven foals born at Benmar-Black, he unfortunately passed away in May 2011. In 2007, we made an exciting new addition to our stud with the purchase of Freark Fan’e Sjongedyk (Olof 315/ Wolmoed Oege Daughter), a Stallion imported from Holland. In April 2009 we were very fortunate to be able to purchase the stallion, Jildert ( Leffert 306/Odiena)(Retired) who was imported from Holland in 1998. Jildert (Leffert 306)was the Overall Supreme Breed Champion HOY 2002 and until 2014 he was and the only Friesian to ever achieve this status. In 2010 we acquired a new Stallion Troje van Doorndraai, who is available for coverings. In June/July 2012, we travelled to Friesland in Holland. We purchased the stallion Arn’e-fan de Kadyk (Tsjalke 397) to strengthen and diversify our breeding lines. Our breeding program has been carefully selected to include some of the top bloodlines in South Africa i.e. : Eibert, Jildert, Friso fan S, Vincent, Victor and Falco T, as well as the Dutch bloodlines of our 2 imported stallions (Tsjalke 397 and Olof 315). We have produced over 100 foals in 10 years including the very last Eibert offspring, 1 colt and 1 filly. Marlene has been taught to administer her own A.I but is not licenced to practise. She is very fortunate to have the help of Equine Services Students who work at Benmar, where they successfully foal down our mares. In the 2012/13 breeding season we produced 11 foals and currently have 50 horses. Our horses compete in and excel at a variety of disciplines including dressage, showing and harness classes. We do have foals, young stock and going horses available for sale. For information regarding covering services by our stallions or to enquire about horses for sale please contact Marlene on 083 390 6988 or email.We have also diversified over the past 10 years and have included an Ile de France Stud, a thriving shavings business, Tripple Options, that supplies the cleanest and most dust free shavings available and each bag is weighed! as well as a Simmentaler Breeding and Commercial Stud.